On a day of remembrance as a Nation, the Gilmer Lady Cats exercised one of the freedoms we enjoy as citizens. The Lady Cats hosted the Ridgeland Panthers on Tuesday in a big region match up. In need of a win to keep pace in region play, Gilmer needed to find a way to get a victory and that they did. Jaylin Vick and Hannah Bennett took the circle for the Lady Cats on Tuesday in a combined effort to shut down a powerful Panthers offense. Jaylin Vick, the starting pitcher for the Lady Cats went three strong innings allowing 2 runs(1 earned) on three hits. Vick had no strikeouts and 4 walks and threw 45 pitches. Coming in as relief for Vick in the fourth inning, Hannah Bennett threw 49 pitches allowing only 1 run to the Lady Panthers. Bennett gave up 3 hits, no walks and had 1 strikeout on the day. The Gilmer defense played almost flawless committing only 1 error in the game. The Lady Cats bats were hot as they were pulled from the bags and hung in the dugout. Gilmer had 11 hits and scored 7 runs over the 7 inning game. The runs for the Lady Cats were scored in the second inning(5) on 5 singles and a double. The fourth and fifth innings had the Lady Cats put up 1 additional run in each. The 7 runs in the game would be enough to hold off Ridgeland and get a 7-3 win in region play. Providing the spark at the plate for the Lady Cats were Mallory Kiser-2 for 3 with 2 runs scored and 1 RBI, Hannah Bennett-2 for 4 with 1 RBI and Emily Dale-2 for 3 with 2 runs scored. Taylor Elliott and Allison Sirmans also scored one run each for Gilmer. The Lady Cats had five more players with one hit each in the win. 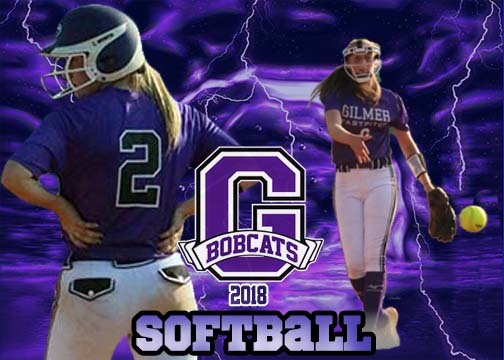 The Gilmer Lady Cats will be at home on Thursday September 13th as they welcome in the Lafayette Ramblers with hopes of picking up another big region victory.